This historic site of the Cripple Creek District Museum features the Midland Terminal Railway Depot from the year 1895. The campus also includes the historic building that once housed Colorado Trading and Transfer, which now is home to the museum’s Gift Shop. The museum also contains several outdoor displays and cabins as well. Since the year 1953, the Cripple Creek District Museum has strived toward preserving the town of Cripple Creek’s history in Colorado. Guests of the museum can explore several different historic structures, including the Assay Office from the turn of the century, the Midland Terminal Railroad Depot from 1895, and the Colorado Trading and Transfer Building from the year 1893. Visitors can discover all the museum has to offer through a self-guided tour that will lead them to explore several exhibits featuring the history of the railroad, maps, mining memorabilia, children’s items, paintings, china and glass, and various furnishings. There is also a gallery for photographs, mineral displays, and Indian artifacts. The Cripple Creek District Museum also features two cabins from the turn of the century, as well as two apartments from the Victorian era. One of the two cabins was once owned by French Blanche Le Coq, and is decorated with period furnishings to contain a historically accurate display. The other cabin at the museum features furnishings that are representative of a miner’s living space during the days of the gold rush. 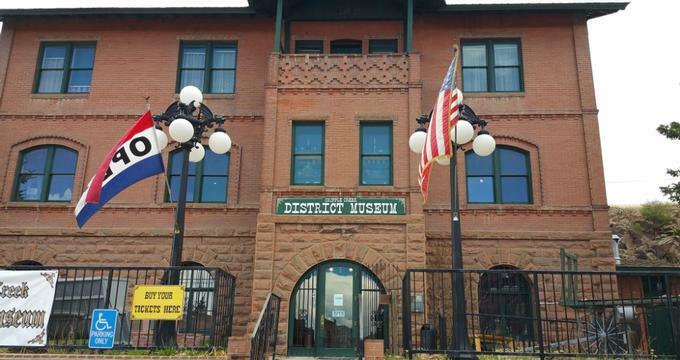 Located on the corner of Bennett Avenue and 5th Avenue, the campus of the Cripple Creek District Museum consists of five different buildings. The building that was once home to the Colorado Trading and Transfer Company and the original Midland Terminal Railway Depot house a wide collection of mining memorabilia, paintings, china and glass, furnishings, children’s item, map, mineral displays, two Victorian apartments, and a photography gallery. The museum complex also includes two cabins once belonging to miners, the assay office, authentic mining equipment, and the original headframe of the Pinnacle Mine. The Cripple Creek District Museum in Cripple Creek, Colorado houses thousands of various archives related to the local history of the area. These archives include documents, booklets and books, city directories, business ledgers, magazines, and family files. The collection also features letters, newspapers, manuscripts, photo albums, photographs, maps, postcards, stock certificates, scrapbooks, Sanborn maps, and various other resources that are historically important. The Gift Shop at the Cripple Creek District Museum offers hundred of various unique and difficult to find items for guests to purchase and take home as a souvenir of their visit. These items include one-of-a-kind clocks, mineral and rock samples, quality reproductions of Victorian glassware and china, handcrafted soaps, candles, oil lamps, Southwestern jewelry, old-fashioned kitchenware, costume jewelry, fine jewelry, vases, toys, postcards, shirts, calendar, flower seed, fixtures, commemorative items, and much more. The museum boasts that it has the best and largest stock of books in all of Teller County that includes a wide selection of books about the history of Cripple Creek. There are also artwork and books by local artists and authors.